There are a number of artists and technologists whose work I admire or from which I have drawn inspiration and ideas. I’d like to take a moment out from my regularly scheduled post to highlight a sampling of them. I’ll start with a company who speaks the most closely to both my style and my craft: Tim Krablin and Melliza Taipe of Modern Cellar. They built beautiful, predominantly solid walnut, small and large wine racks and wine cellars, and developed quite a following with projects commissioned by both vintners, custom remodeling, and art festivals. Unfortunately, however, they closed up shop in 2010. I first stumbled across their products at a furniture store in San Francisco in 2007, and have since recreated one of their wine racks from memory, as well as developed a few things that draw from their style. Bruce Shapiro has spent many years developing “the art of motion control”, applying this typically industrial technology to artistic expression. Have you ever seen a robotic arm doing a ribbon dance? Or pictures created by the carefully timed release of bubbles in test tubes? He’s your guy. I’m impressed by the way he brings together multiple domains to create unique and in-motion art: there’s clearly the artistic and creative vision, but there’s also the highly-mathematical programming, there’s the physical elements of valves and motors, and tying those pieces together. And of course, there’s the craftsmanship of “making it beautiful,” hiding all the technology in an artful way. I first saw Bruce’s work at the San Mateo County Maker’s Faire in 2015, where he was exhibiting Sisyphus. 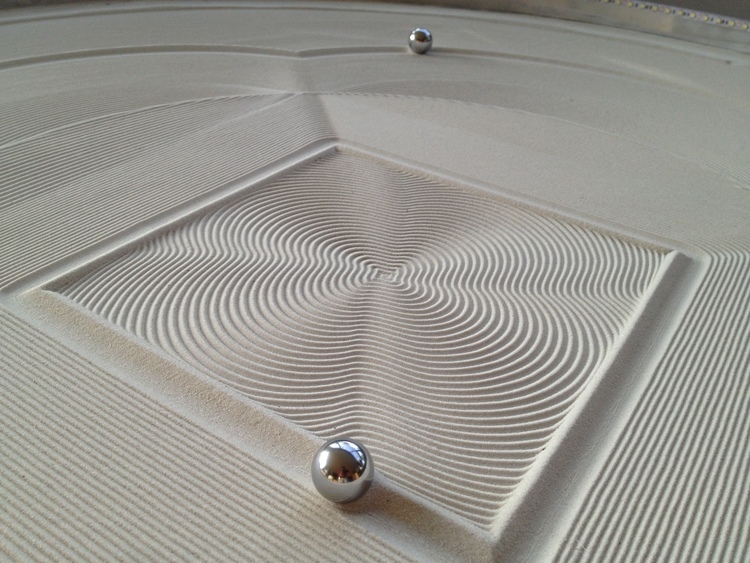 This is essentially a table that supports a bed of sand, under which is hidden a rotational plotter that drags a steel ball through the sand via magnets to draw mesmerizing geometric patterns in the sand. Though at the time, he had built just a few of these for exhibitions, in late 2016 he announced a KickStarter with a $50k goal; it achieved $1.9m in pledges of which I was one of the first twenty to commit. Inspired by Sisyphus, before he launched his KickStarter, I took a stab at building a version of it myself. I developed software to create nifty randomized geometric patterns for a rotational plotter, learned the Arduino system and the basics of a Raspberry Pi to control it, and started procuring stepper motors, power supplies, gears, and the like from all over (well, mostly China) to try to make it a reality. Let’s just say I’m glad Bruce decided to commercialize it - he saved me a lot of time and money, and I have confidence that his piece will display far better in my living room than what I was developing. I came across Orfeo Quagliata’s work at a show in San Francisco about a decade ago. Though he works in a number of mediums - and even studied furniture design at the California College of the Arts - the pieces that I was particularly impressed was his glass work, and in particular, the “barcode” collection. However, all his work is just amazing, typically lighting uniquely formed glass to highlight the interplay of colors. He’s also a partner in Phuze Design, which highlights several glass artists, each with a unique and impressive style. If only I had the space (and the budget)…! Though I’d be the first to admit that they pale in comparison, my backlight glass block nightlights are inspired by Orfeo’s work. Is there an artist that inspires you, that bridges amazing design and excellent craftsmanship, perhaps with a streak of modern technology, whose work you admire? If so, I’d love to hear about them!